If it wasn’t for the fact that I had twins that didn’t catch on to sleep that well I would never have gotten a pram and just stuck to my carriers like moss to a tree. 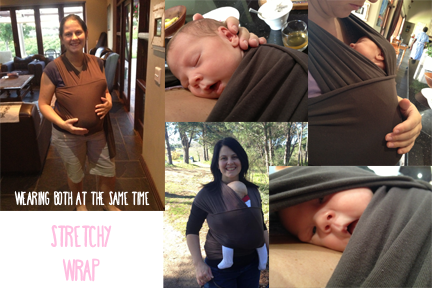 In the first few months I had a stretchy wrap that really did the job for me. It kept the twins close to my chest and close to each other and it was just really comfy and both me and them were assured of their safety. Soon though they grew out of it and I tried a ring sling for a while that didnt really serve me well. Eventually I opted for an OM BABA Mei Tai. I liked the Mei Tai so much and felt like I was finally part of the baby wearing community now that I had a Mei Tai… I mean seriously, Mommies can go on about their Mei Tai’s and now I also know why. The Mei Tai is classic and comfortable and there are many different ways of tying and carrying. 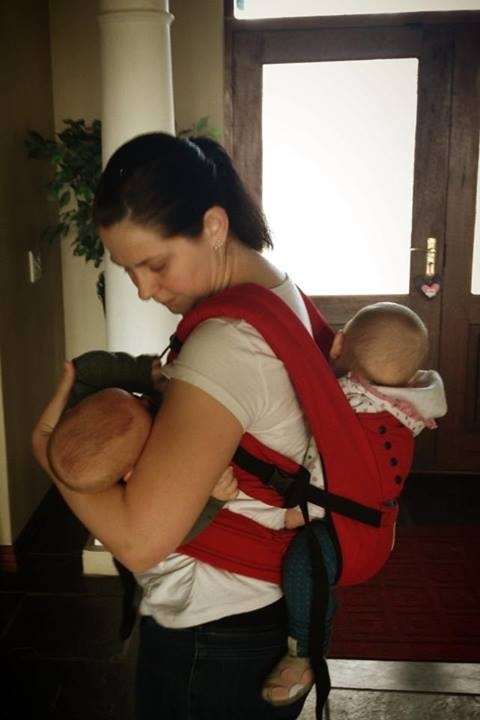 With twins I realised I needed two strong carriers though and honestly all the wrapping and tying multiple times a day every time they wanted to get in or out of the wraps got to me so I searched for something that just clips in. Oh my Ergo!!! I am absolutely in love with the Ergobaby Sport and I won’t trade it for the world… In fact I have no idea how I’ll be able to part with it one day when they have grown up. It will probably always stay in my chest of precious keepsakes unless I have a VERY good friend to give it to by then!! The Ergo is strong, light, comfortable and it saves a lot of wrapping time. By simply going Clip, clip… you are ready to go and my kids have never been as happy in any other carrier. They are really versatile and made of very strong fabric. A sleeping hoodie is attached to a front pocket (not suitable for carry-ons) and snaps easy peasy at different tightness settings to the shoulder straps to protect baby from the sun and hold their head in place while sleeping. The best of all is that it really looks cool on dads no matter what their size! My husband, like many other men doesn’t like to wear girly things but wants to be involved with the kids as much as he can. 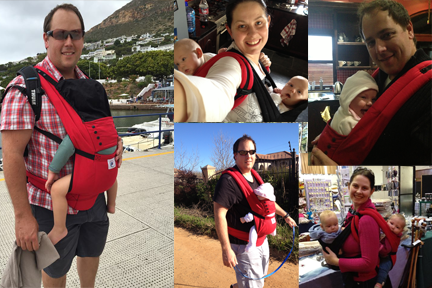 He LOVES wearing them in the Ergobaby Sport and it is so great for their bonding as well. I have worn them both front/back in the Ergo’s and I have also used them with one in Ergo at the back and Mei Tai in front which I preferred. They are really versatile and made of very strong fabric. A sleeping hoodie is attached to a front pocket (not suitable for carry-ons) and snaps easy peasy at different tightness settings to the shoulder straps to protect baby from the sun and hold their head in place while sleeping. A friend asked me the other day how I have been able to keep them happy for so long in the carriers. They are Two years and two months and still loving spending time in the Ergo’s. Well partly I believe its because I started wearing them from the beginning but I believe the most important part is both our comfort in the Ergo’s. If it wasn’t for that we would have given up long ago. Its not that they are not busy toddlers… Oh believe me they are busy and they can run around like maniacs sometimes but when it comes to that or they just want to be picked up while Im trying to cook or doing something in the house theres no greater life saver than my Ergo’s! Wearing my babies have kept us close together and helped so much to have and extra pair of hands when I needed it most. 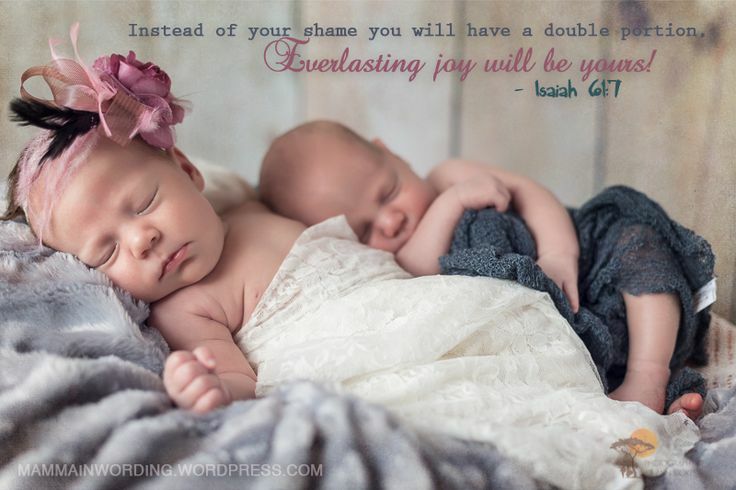 For a long time it was the only way I could put them to sleep and till this day, when the other methods doesn’t work that day for some or other reason, the carriers always win! 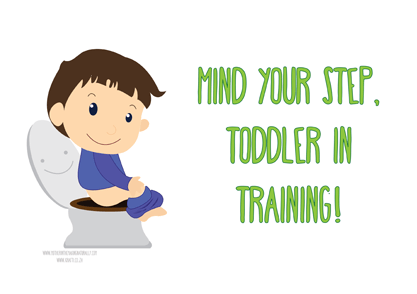 Free Printables: Toddlers in Training! 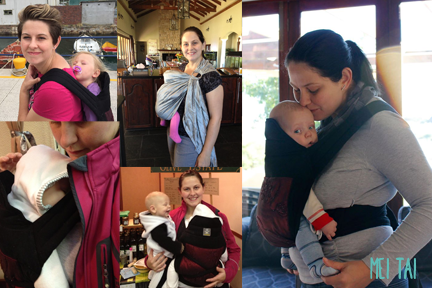 Ek borsvoed ‘n tweeling, co-sleep en beoog babywearing… so sue my! Hoekom het die lewe so moeilik geraak vir jong Mammas? In die verlede was dit maklik… of was dit nou moeiliker?? ‘n Baba is vir jou gegee en jy moes maar sien en kom klaar sonder al die informasie wat ons vandag op die tv, internet en in tydskrifte kry. Hierdie informasie is nou wel great vir my, maar omtrent alles is kontrasterend!